Folders provide students the ability to organize their work, and maximize their time. They also provide your school with the ability to share information between parents and teachers. 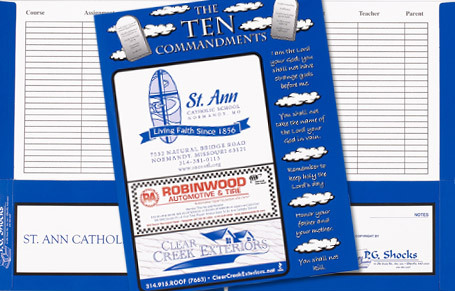 Choice of school information to be printed on the inside: homework grid, school rules & regulations, sports calendar, etc. 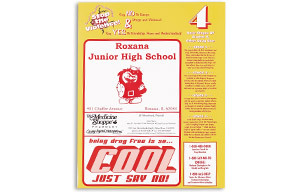 Drug prevention/anti-violence themed folders provide positive reinforcements daily to your students while helping them keep their work organized. Bullying in schools today is one of the biggest challenges our students face. 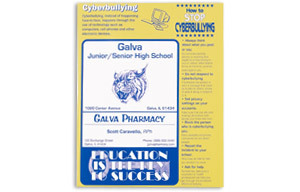 Help to educate them about the dangers and effects of bullying. Internet safety folders provide students with vital information on how to be safe while using the internet. Teach your students about how to protect themselves online.